Posted on 16, September 2016 by EuropaWire PR Editors | This entry was posted in Automotive, Electronics & Machinery, Technology, United Kingdom and tagged electric drive system, GKN Driveline, Peter Moelgg, Phil Swash, plug-in hybrid vehicles. Bookmark the permalink. Worcestershire, England, 16-Sep-2016 — /EuropaWire/ — GKN Driveline has developed a complete electric drive system for plug-in hybrid vehicles. The system starts production in 2019 on a global platform from a European vehicle manufacturer. Tighter integration of electric drivelines improves system efficiency and gives automakers more packaging and assembly options. The new module integrates a water-cooled electric motor and inverter with a single speed eAxle reduction gearbox. The system generates a maximum 65kW of power and can deliver up to 2,000Nm of torque to the rear wheels. The complete eDrive module measures just 300mm high and 325mm wide and weighs 54kg, making it around 20mm narrower and 2.5kg lighter than comparable systems. GKN’s systems expertise ensures that, despite significant differences in the acoustic signatures of the inverter, motor and gearbox, the overall system delivers a smooth, near silent electric driving experience. GKN has been advancing the development of eAxle technology since 2002 and has produced more than 300,000 units at its manufacturing facilities in Europe and Japan. The company was awarded Official Porsche Technology Partner status for its contribution to the plug-in hybrid Porsche 918 Spyder programme. 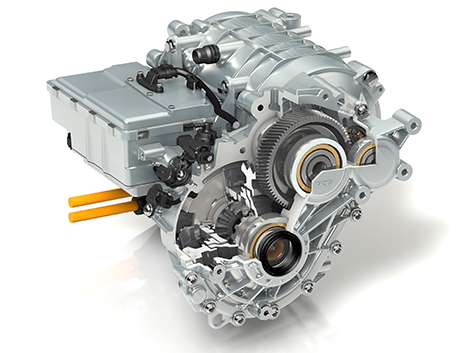 GKN launched the world’s first two-speed eAxle in the plug-in hybrid BMW i8 and also supplies the eAxle on the Volvo XC90 T8 Twin Engine PHEV programme.